The Devil's Hat burst through to the other side. 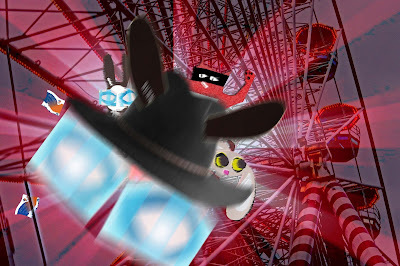 The Wabbit found himself circling a funfair ride he knew as 'The Big Prawn' and listening to an automated voice. "This is the last stop of this Ghost Train. Please pick up your spectral photographs at the kiosk." The air whistled with spooky cries and the clacking of crustacean limbs. "We'd like to get off now," said the Wabbit but there was no reply. The Devil's Hat orbited faster than the big wheel, plunging low then soaring high. Everyone felt seedy. The voice shrilled again. "You may hop off and hop on again at any time. Please retain your ticket stubs." Skratch found himself searching for tickets he never purchased. Lapinette had an all entry VIP pass for everything and anything, but had left it in her other frock. The Wabbit found two lunch tokens and a half eaten salad sandwich. But the wind caught the tokens and sent them spiraling downwards. The Wabbit watched them go but he looked at the ground and it was coming up fast. So he tucked the sandwich back in his fur and held on. "Best I can do," he muttered. The automated voice changed tone. "Please fasten your spook belts." "There are no belts" hissed the Wabbit. The haunting voice of Ghost Bunny cut through the fairground babble. "Spook belts incur a extra charge..."